Are you interested in becoming a member of the Roman Catholic Church? The Rite of Christian Initiation for Adults, or RCIA, is a process whereby adults enter upon a journey of faith culminating in full membership within the Roman Catholic Church. Perhaps you have received the Sacraments of Holy Eucharist and Reconciliation but have yet to receive the Sacrament of Confirmation. Wherever you may be along your journey of faith, the Roman Catholic Church welcomes you and is here to assist you towards full membership. RCIA sessions, which include Mass attendance, will be held on Sundays from 9:30 a.m. – 1 p.m. Please contact Honora DeMaio at (732) 816-8514 to register, for further information or if any active parishioner would like to join our RCIA team. Anyone under the age of 14, please contact the Religious Education Office at 732-721-1514. Registration is now being accepted for any adult who is interested in celebrating the Sacraments of Baptism, First Communion, and/or Confirmation. Please join us as we journey through the scriptures and learn more about our Catholic faith and tradition. You must be at least 14 years of age to attend the RCIA (Rite of Christian Initiation of Adults), 16 if you seek Confirmation only. Anyone younger, please contact the parish religious education office. Please contact Honora DeMaio at (732) 816-8514 to register, for further information or if any active parishioner would like to join our RCIA team. Hospitality – we provide coffee, juice and baked goods each week. Catechist – we are a team and welcome others who would like to share their faith. No theology degree needed! If you can help in any way (especially with prayers), please contact Honora DeMaio at (7320 816-8514. The following link will direct you to our Diocesan Website. 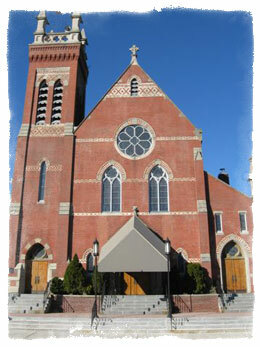 There you will find information regarding the entire process of the RCIA Program.